I’m quite interested in New Zealand’s old architecture, particularly those old colonial buildings that we haven’t preserved much of, but can still be found. 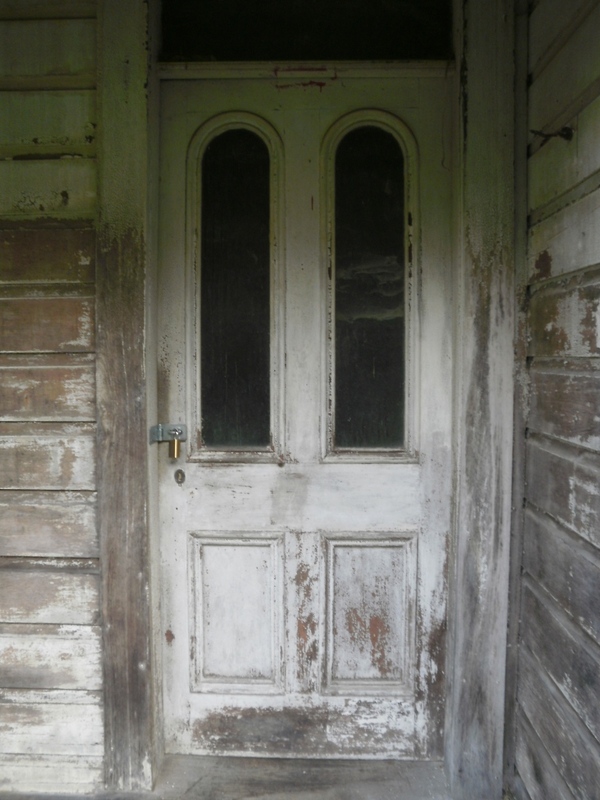 So I went to Glenside, near Tawa to see an old colonial house. Apparently the suburb of Glenside used to be called ‘Halfway’ back in the day because it was located right in the middle between Wellington and Porirua. What a cool name for a suburb, understated and very kiwi. Nowadays we get meaningless poncy names thought up by some developer. Nott house was built in the 1850s for a settler couple, and that’s about as much as I know about the history, or want to go into at this stage. If you’ve been reading the paper lately there’s also rumours of murder and ghosts in the house, but I was more interested in the building. 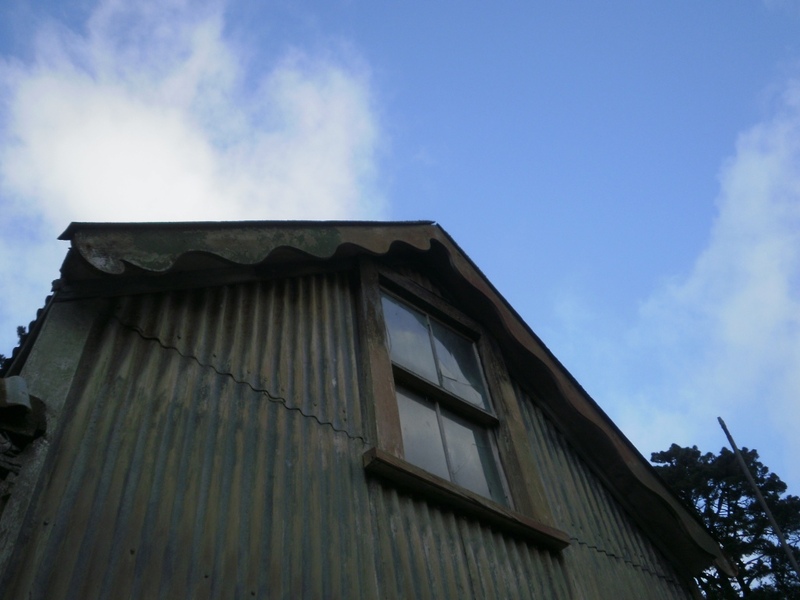 As you get up close to the house the two obvious materials used are corrugated iron and timber (native of course). Its what you would expect, simple materials for a house that sheltered people who just needed to get the job done. The first part of the house, clad in iron, is so basic, it would look like a barn if it weren’t for the windows. But what I found interesting is that it isn’t simply a working house, there are some details thrown in that give the house a bit of love. Was it the wife’s touch? I don’t know, I can’t see it being the man’s. For instance the barge boards are cut into gentle curves and the end of the porch also has some semi-circular shapes. They give the building a bit of fun. On the front of the verandah there’s more interesting shapes too, repeating triangles that kind of look like a Maori/Polynesian pattern? A lot of work has gone into the timber posts of the verandah, and they look like they’d be more suited to a Roman building. The English migrants couldn’t help being a little pretentious I guess. Like other colonial houses I’ve seen it’s really a 1 and half storey house. It would be barely possible to stand up on the first floor, and most of the upstairs space hard to use because of the roof sloping down onto the walls – more like a habitable attic. The small dormer windows I can’t imagine do a great job of getting natural light into the upstairs area either. On a hot day in summer with no insulation between the roof, it would be absolutely cooking up there. Not a brilliantly designed space, but probably ok for sleeping only. For some reason the windows on these kind of houses look a bit big to me, like they’re for people 7 or 8 feet tall. But maybe I’m used to seeing the smaller windows on older European cottages. 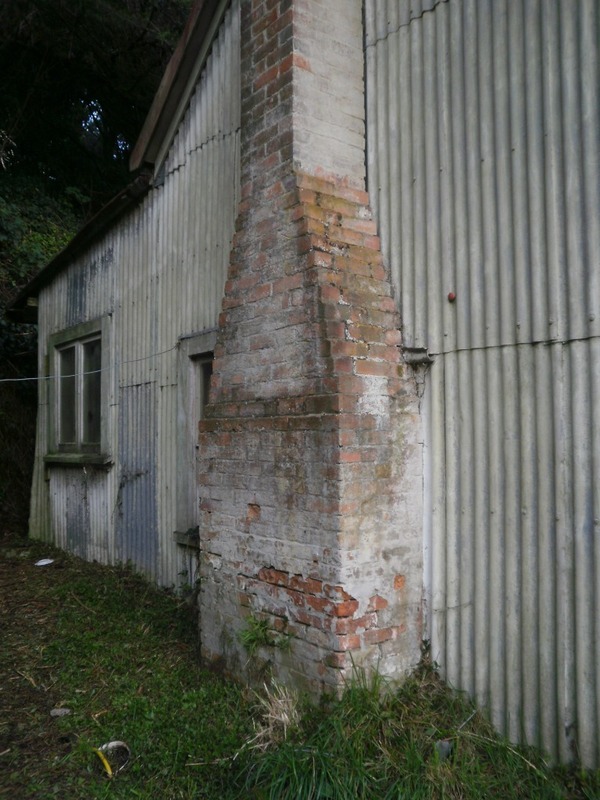 What can you gleam from some of the earliest New Zealand European buildings? It’s sad we don’t have much physical sign of pre-European Maori buildings. The signs of earthworks are there in places like on One Tree Hill in Auckland, and even those I find impressive or maybe just mysterious as you’re left to wonder what structures might have been there, and what life was like back then. Thanks Sav! 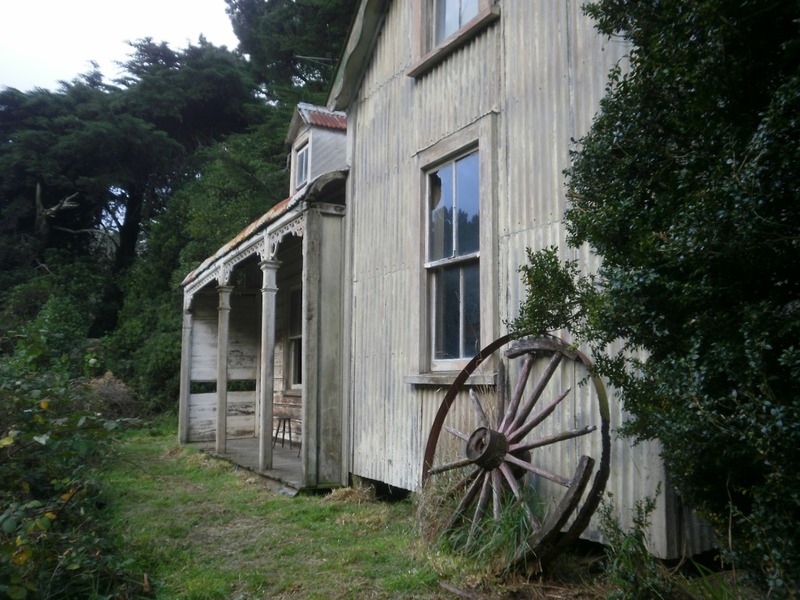 It is impressive how well this building has weathered – the paint appears to have worn off the weatherboards, yet the old timber (kauri? rimu? totara?) seems to be coping well. Might even last another 100 years. And the corrie iron roof – they certainly don’t make it like that any more, with a whacking great load of prime quality zinc on the outside – amazing that there is not more rust – or more holes through the rust. I think it was / is for sale? Needs some loving – could scrub up well for a Halfway House. I wasn’t sure how much of the building was original when I was taking photos, but it could be mostly original? 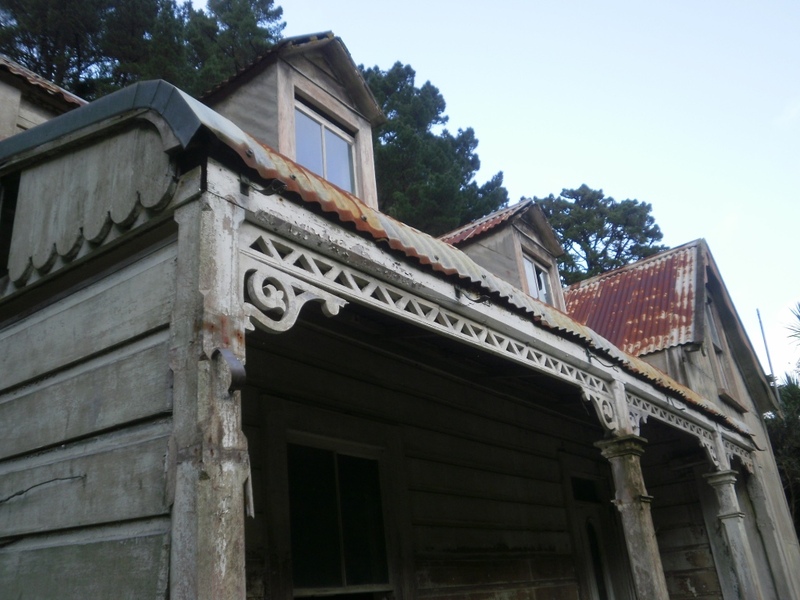 I’m guessing the weatherboards are totara, since it would have been locally available and easily worked, and maybe the natural preservative in the timber have kept them looking in great condition too. Got to love the old wagon wheel out the front! A bit of the history behind it.